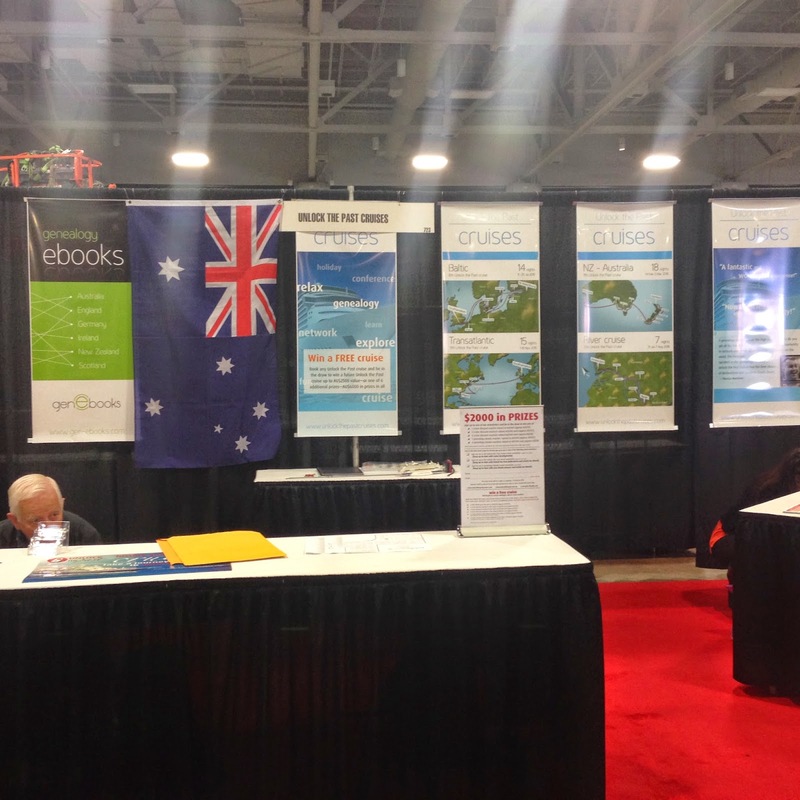 RootsTech and the Federation of Genealogical Societies ran a combined conference this year in Salt Lake City. 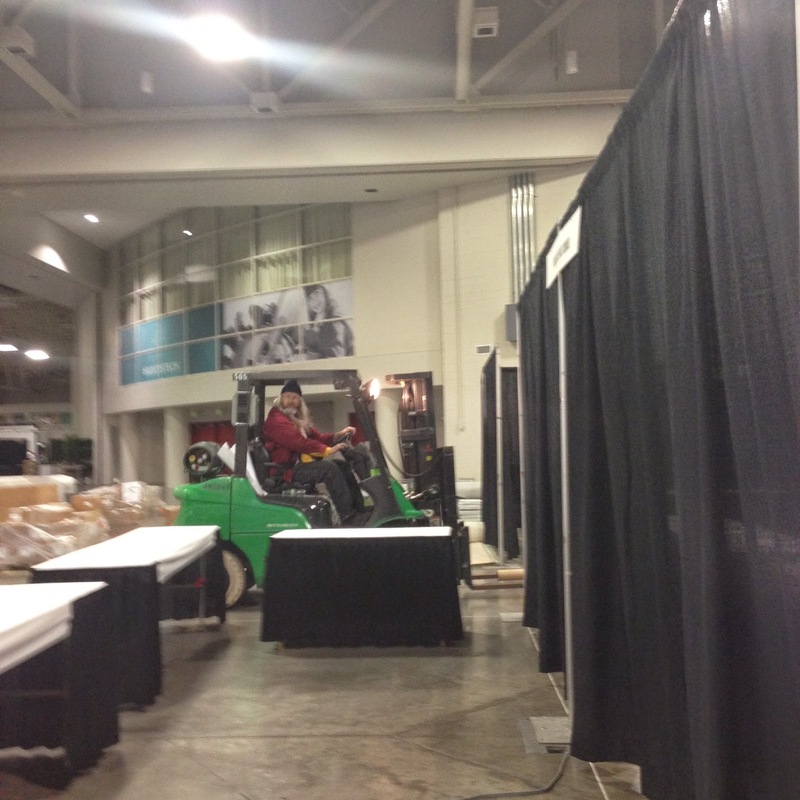 Wednesday was set-up day for the vendors in the Expo Hall which was a combined exhibition for the two conferences. This meant I did not attend the morning talks as I was helping set up our Unlock the Past Cruises booth. 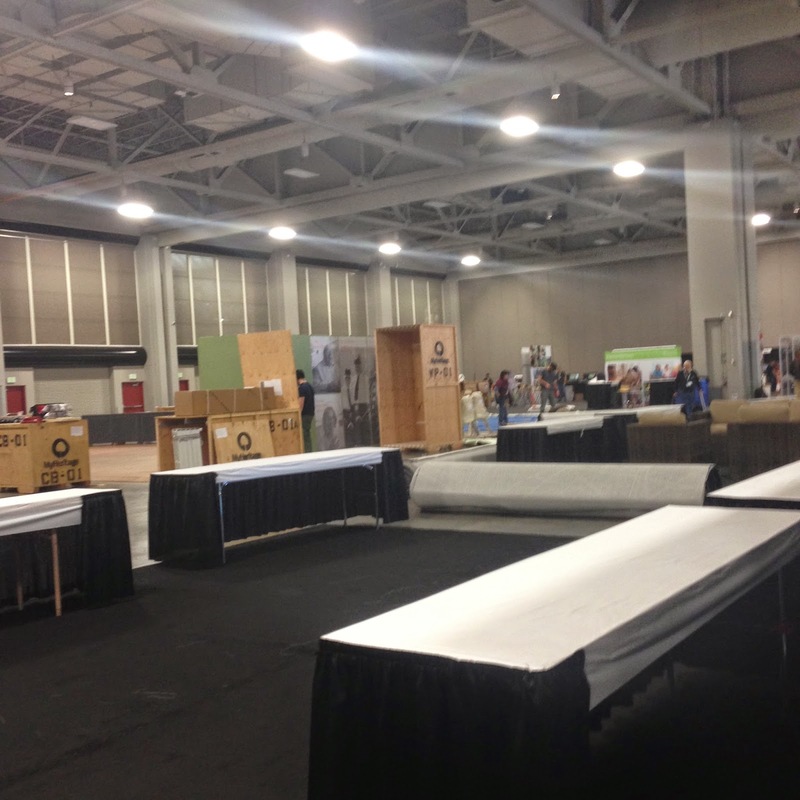 It is always amazing to see an empty shell transform into the Mecca of Delight for attendees. There were 173 exhibitors, some of which had very large booths. There was a great range of exhibitors.The big data providers, Ancestry, FindmyPast, MyHeritage and Family Search. The Federation of Genealogical Societies (who do Society Showcases) along with a number of societies including the Southern California Society, Guild of One Name Studies and National Genealogical Society were also present. Maia’s Books had a very large stand full of wonderful goodies (yes some of which did end up in my possession!). Rootsmagic and Legacy were present as were Evidentia and Clooz. Family Tree Maker was on the Ancestry booth.There were areas you could get your books and photos scanned and of course places to eat. Our stand nearly done. Doesn’t the red carpet look nice? The Board for Certification of Genealogists, ICAPGen, the Association of Professional Genealogists, the Association of Personal Historians, Brigham Young University, National Institute for Genealogical Studies were all present. Then it was time to leave the Expo Hall and the other booths setting up to go to the afternoon sessions of the FGS Society Day. St Peter Port, Guernsey was our next stop and again we were being tendered to shore. I have always had an interest in Guernsey as it was the only part of the British Isles to be occupied during World War Two and it was a regular holiday haunt for some of my English cousins and I found out just before I went away was my boss’ wife ancestral place! For a while I was not sure i would be going ashore as the sea had a bit of a swell and when you are not very tall, not very agile and the side of the tender boat suddenly drops three feet just as you are about to step on it gives you pause for second (and third!) thoughts. Shame there wasn’t a camera around as my face must have been a picture! The sea, boat and I got in tune finally and I was safely on the boat. The Guernsey sea front was quite colourful. The guide told us they had reclaimed some of the shore front and that the sea used to sea lot closer in. We were doing a tour of the island by coach. Guernsey is a tax haven and is business home to 70 or so international banks. This has also meant that home prices are extreme, costing million plus pounds for some fairly ordinary places with many places costing more than London prices which seemed horrific enough to us. 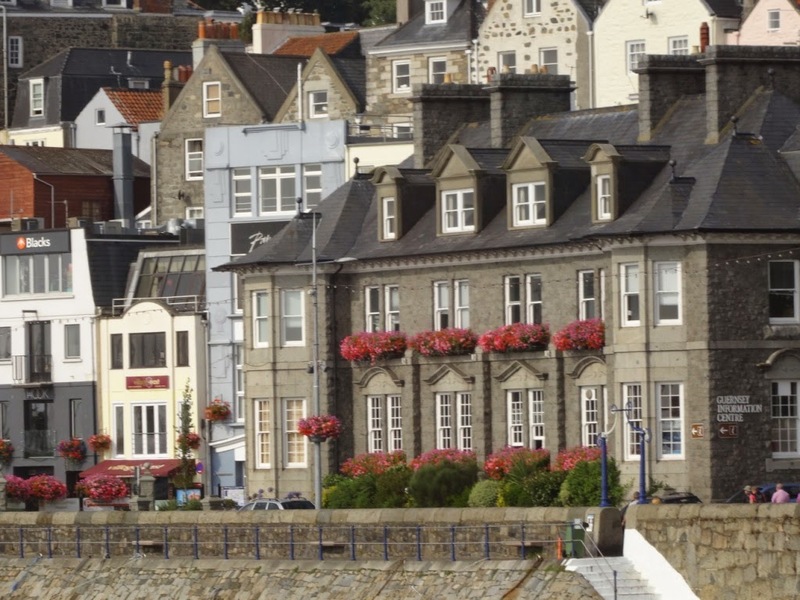 There were, of course, quite a number of mansions on Guernsey as you would expect for the home of more than 70 international trading banks and heavens knows how many companies head offices. 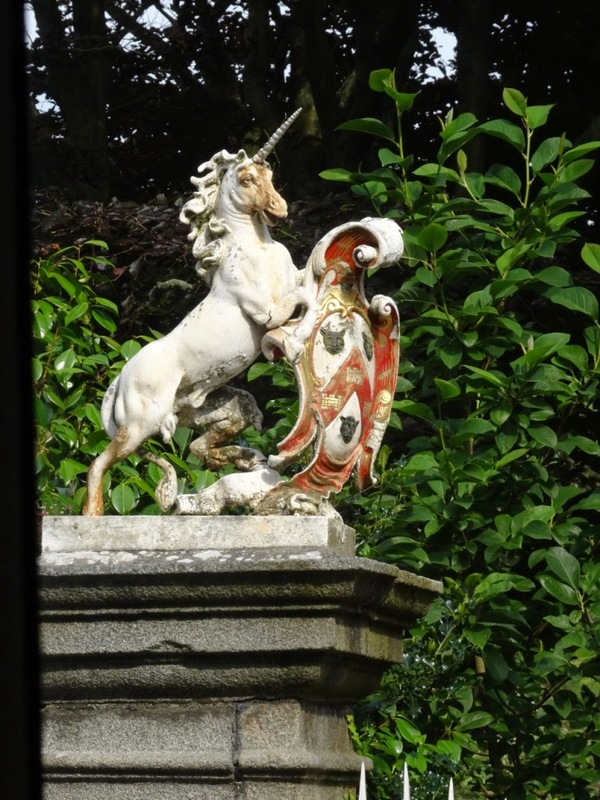 I’ll never be the sort of person who has a mansion that needs a gatepost topper like this unicorn on my gate post. Although maybe I could make an exception and a dragon could adorn my gate post of my humble abode as I love dragons and have collected them for years. This is the Little Chapel. It was built by Brother Déodat who started work in March 1914. 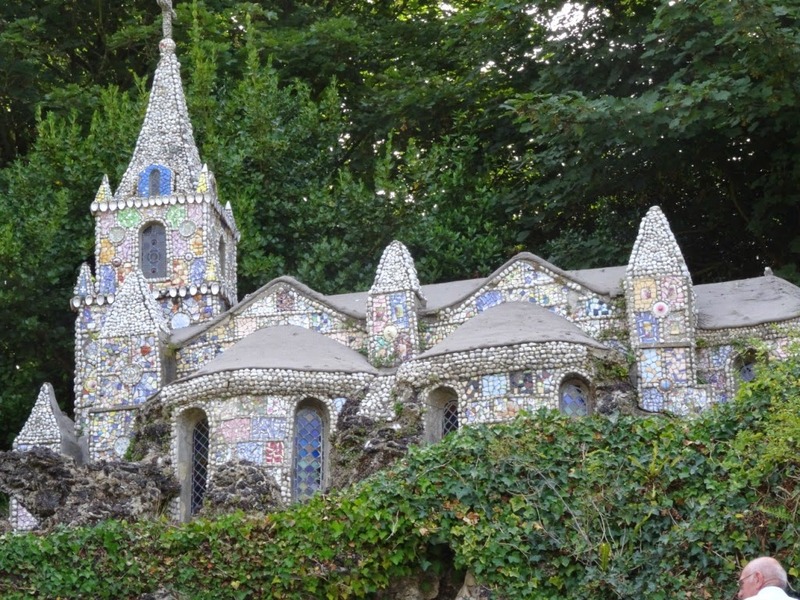 His plan was to create a miniature version of the famous grotto and basilica at Lourdes in France. Apparently this was his second model as it is said the first model was taken by his bishop back to France. 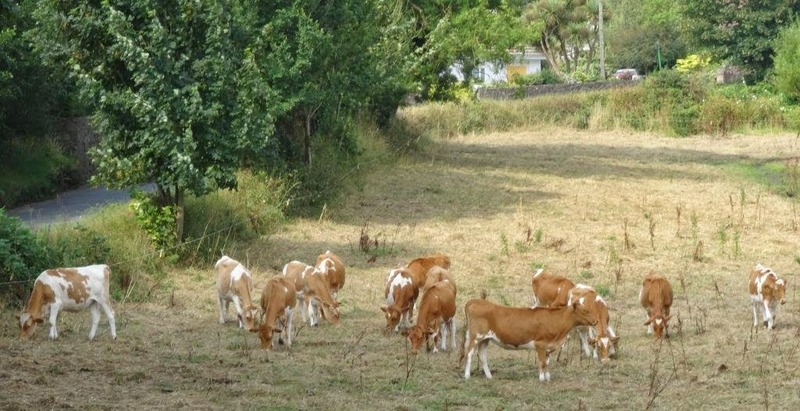 You can’t come to Guernsey and not at least look at the cows that along with the Jersey cow are the progenitors of so many dairy herds around the world. 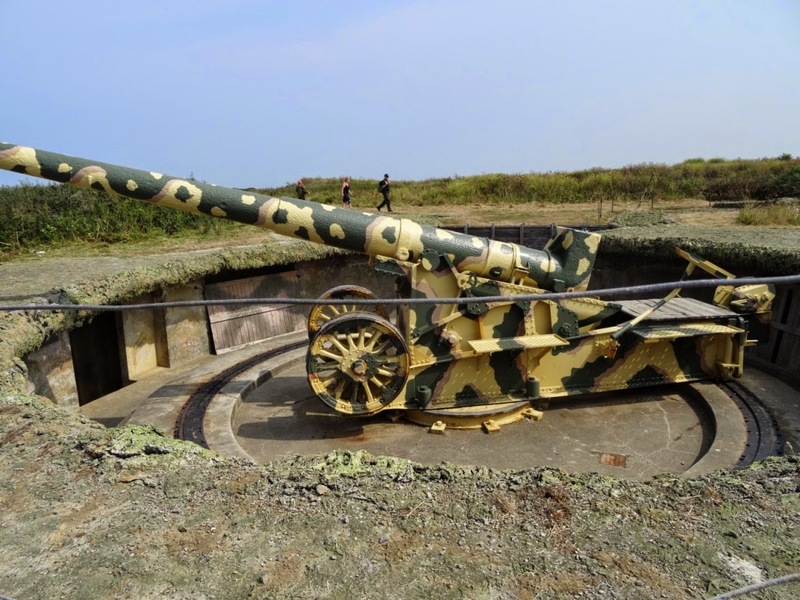 Guernsey was the only part of Britain that was occupied during World War Two. Evidence remains around the island of bunkers, gun emplacements and the memories are long of the difficult times that were endured. On the coach tour were a couple of people who had been evacuated as children and I had a nice chat with them about a book I had bought about the evacuation, living in England with strangers then coming back after a number of years to family that had almost become strangers. Guernsey was a lovely place and one day hopefully I’ll go back for a longer visit. There had been a number of people who had missed my Timelines talk as they had attended the other presentation in the same time-slot. I had agreed to present it again during the Research Help Zone session today so headed back to get ready for that. Then there was the Eileen O Duill and “Dublin, 30 June 1922: did everything blow up?” and of course the answer is no, not everything was lost. Yes there was a tragic loss of some records and no, the censuses that don’t exist today were not all burnt then as some had already been destroyed by the Government previously. We are seeing many more Irish records being digitised and available outside the Irish archives and this is wonderful. Ireland is definitely one of the places where you have to know the history, politics and legislations in plae to know what records are likely tohave been created and what could be available today. The opposing session was Marie Dougan talking on Scotlands People. I had already had my great win using Scotlands People back at Inverness where i was able to acquire so many records for my fifteen pound investment. Then Alan Phillips gave an update on the planned future cruises and you can find out more about them and download the new cruise brochure here. 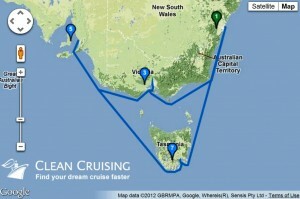 As a teaser there is the Sydney cruise in October this year, the Western Australian one in January 2015 to commemorate where our boys left from to go to Gallipoli 100 years ago, the Baltic cruise cruise in the middle of 2015 and then the Transatlantic one in late 2015 and a number of others after that including the New Zealand one where the eminent lecturer the legal Genealogist Judy Russell will be the lead presenter in early 2016. Then it was time to have dinner and chat in the lounge where there were comfortable chairs, power-points (an essential item!) and genies talking family history. Some of the genies had been spending a bit of time at night collaboratively doing a jigsaw puzzle and they had completed it. The topic was quite appropriate in timeframe. There was a very creative Chef aboard the Marco Polo, who had had training as a wood carver. he created some very interesting fruit/vegetable animals and displays. As genealogists we research our family history and accumulate pages of facts and notes, some photos maybe some letters if we are lucky. Then it comes time to want to share your research, to produce it so it is available for the future generations, to tell their story, to bring them to life. So you sit down at the computer and try and start. But how to write it in a way that someone will actually read it? We have all read (well at least scanned to see if our names are mentioned) the family history books that read like a “who begot whom” saga. The problem is no-one actually sits and reads them because they are a bunch of dates and places with no personality and definitely don’t bring our ancestors to life. So what do you do? 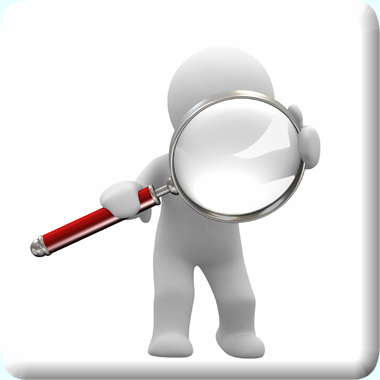 How to write it so someone actually will read and know the people you have spent your time researching? I have just attended the two day Unlock the Past Writing Seminar in Adelaide and would definitely recommend it for anyone who writes. There were eight presentations given by Carol Baxter of History Detective fame. 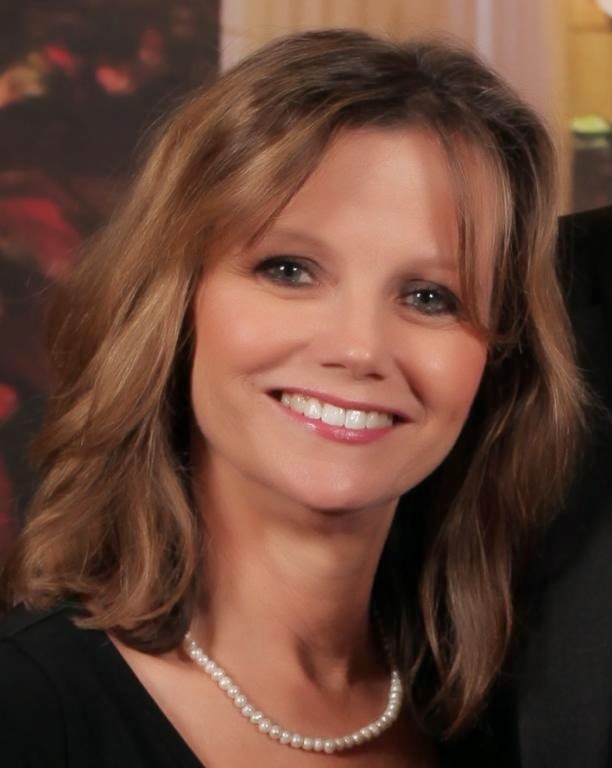 Carol has an impressive pedigree as she started her genealogical research at school and been involved in genealogy for more than thirty years. 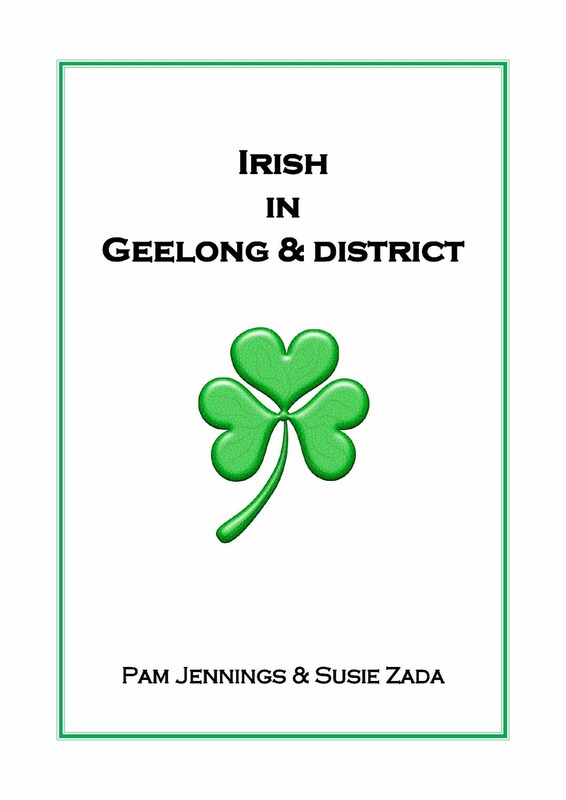 She is a Fellow of the Society of Australian Genealogists and an adjunct lecturer at the University of New England, and is now a full-time writer and speaker. She has used her historical research skills to write and publish ‘popular history’ and is the author of four ‘true-crime thrillers’ . Three have been published by Allen & Unwin: An Irresistible Temptation: the true story of Jane New and a Colonial Scandal (2006), Breaking the Bank: An Extraordinary Colonial Robbery (2008), and Captain Thunderbolt and his Lady: the true story of bushrangers Frederick Ward and Mary Ann Bugg (2011), while The Lucretia Borgia of Botany Bay will be published in 2015. Also recently released was the “The Peculiar Case of the Electric Constable” which I was able to get Carol to autograph for me. Help! Which information is correct? Strategies for determining historical truth. Carol’s easy interactive presentation style made it a pleasure to listen and learn. Her use of examples throughout gave not only the theory but also the practical applications and reinforced the messages. “How do you start the massive job of writing your family history book : just like the elephant, one bite at a time! “Timelines a writer’s friend for research and also when writing as you can put the timeline in the appendix therefore leaving out of the main test long lists of just dates and places”. This seminar focused on basic structuring techniques for writers. 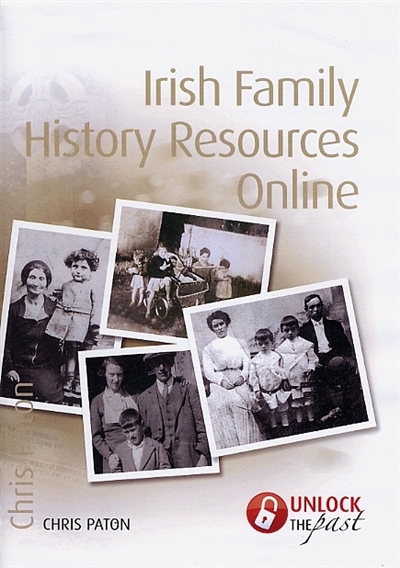 It included a general overview of structural necessities as well as guidelines for those writing family histories. 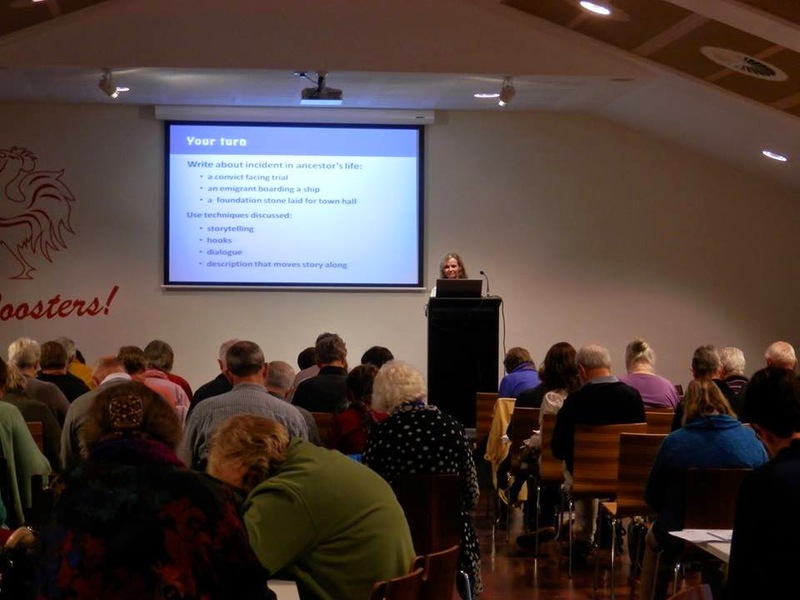 On the Friday we also heard from from Rachel Kuchel from the Lutheran Archives on their holdings and after hearing about the wide range of records from around Australia it really made me wish I had Lutheran ancestors! Then Dr Karen George talking on Oral history for family and local historians, another very interesting topic. South Australia allows people to borrow the recording equipment and they will archive a copy of the recording (which can be allowed to be on open or closed access depending on the wishes of the participants). Definitely worth finding out if your State library has a similar program happening. Recording using great equipment is the ideal but obviously even a not so great recording has to be better than no recording. 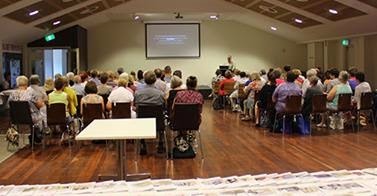 Tamara Wenham and Nicholas Gleghorn gave a presentation on “Finding stories inside the Commonwealth, State and Local Government archives” This was particularly interesting as it showed the range of records, particularly images that were available. And that completed Day One! Day Two we were all there early eagerly waiting for what the day would bring and chatting to the exhibitors and each other before the presentations began. Today’s first three workshops were about refining our work and understanding writing fundamentals. This workshop covered some of the tools found in a writer’s toolbox including authorial voice, narrative voice, style, tone, person and story-telling. This workshop showed how to use historical context, action, dramatic tension, dialogue and description to engage their readers. This workshop showed writers how to engage their readers by drawing upon all of our senses, and burrows down to the individual word level. Here we all are having a go! We had opportunities in each of these for practical hands-on tries at doing what we had learned then hearing what some of us had written and this was a very valuable part of the workshop. I find that having a go while it is very fresh in your mind helps to cement the concepts. The last of Carol’s presentations covered all the facets of publishing, taking us through the process of the mainstream publishers (I don’t believe that very many family historians will ever go this route) then onto the independent publishers, much more likely for family historians and the other ways of being published (niche, independent and self-publishing and then journals, newsletters and websites including blogs). So many family history writers forget their family history journals as a place to publish their writings. 99% of the editors of these journals would love you for evermore if you submitted your articles and it is a good way to get experience. 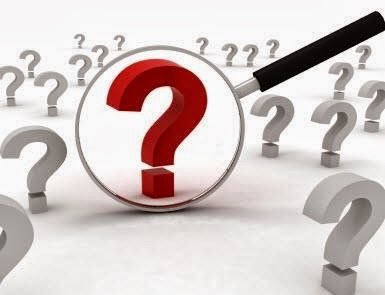 Also you have the extra benefit that you are telling people about your research and giving them the opportunity to contact you with questions and additional information (remember to have a genealogy email with Google ie a GMail address that will stay constant regardless of what home internet service provider you may use). I have had responses many years after my article was published because I was able to be contacted. Shauna showed the range of resources that can be used and this fitted in very well with what Carol had been telling us as Carol has made wonderful use of newspaper, court and police reports in her research to get some of the specific details of what had occurred. Often inquests, divorces, murders, accidents are reported in the papers in much detail often down to the “he said, she said” stuff. All valuable detail that can be used in your writing to provide wonderful life to those dates and place facts and still do it in a historically accurate manner. Marie Maddocks gave us a presentation on “Exploring people’s lives @ The State Library of South Australia”, another wonderful resource for South Australian research and remember each State Library has similar resource collections so if you haven’t had a check of their catalogues recently you should definitely add it to your to-do list. I am very pleased that I flew down from Brisbane for this two day workshop. I found it very valuable and would very much recommend this workshop with Carol Baxter to anyone who is interested in writing history whether it be family, local, business or any type of historical writing.